Machine modularisation and the trend towards a decentralised architecture mean that control and drive components frequently need to be installed on moving machine parts, and occasionally on rotating parts. Their power and data supply relies on slip rings. 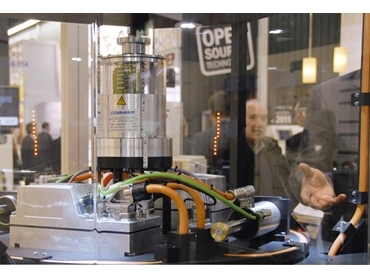 The Ethernet POWERLINK Standardisation Group (EPSG) exhibited an assembly with B&R ACOPOS multi65 drives on a rotating machine part at the Nuremberg SPS/IPC/DRIVES show. With a Cobham slip ring, connectivity of the 24 V power supply and the 750 VDC DC bus as well as the control data was accomplished using Ethernet POWERLINK and openSAFETY. As a first in industrial applications, data at a rate of 100 Mbit/s and the DC bus voltage were simultaneously transferred via the slip ring. According to Martial Favrat, Head of the Engineering Department and Product Quality Manager at the slip ring manufacturer, Cobham, their engineers were impressed with the stability and EMC compliance of the POWERLINK protocol. Cobham has performed comprehensive tests on their slip rings to guarantee transmission quality. Individual frames used by POWERLINK ensure higher data transfer reliability than that of protocols using the first generation ‘summation frames’ approach. POWERLINK and openSAFETY keep the automation world turning with series production applications using slip ring data transfer for drive and safety technology already fully implemented by B&R. DAANET is the Australian master distributor for B&R Automation.